New Lookleft in shops now. | Come Here To Me! New Lookleft in shops now. 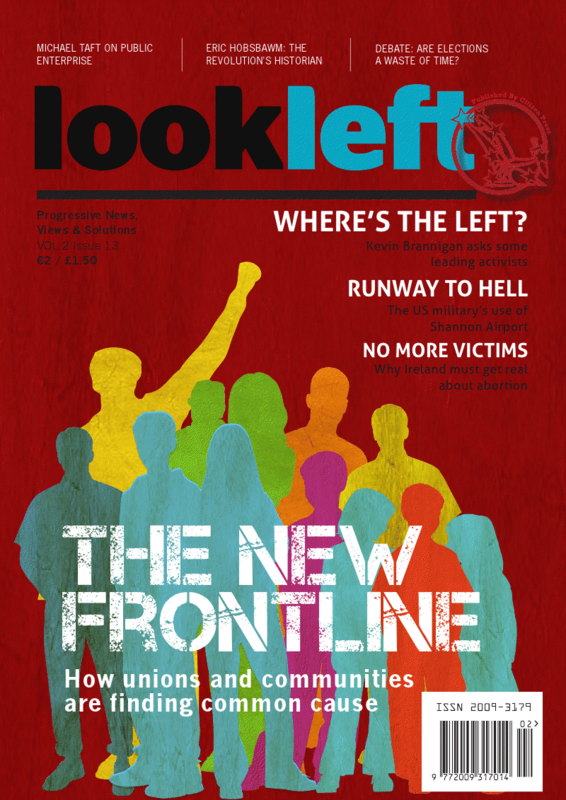 Issue 13 of Lookleft Magazine is in shops now, and it’s another interesting issue. Irvine Welsh throws his weight behind the campaign to name Dublin’s newest bridge in honour of fellow-Hibernian F.C fan James Connolly, while my favourite article in the issue looks at the topic of Dublin Bus and the potential privitisation of that service. From ourselves, I have a report on a recent meeting in Barcelona of historians interested in promoting the idea of a ‘History From Below’ of Europe, through walking tours and indeed websites like this one. An interview with Boots Riley of the brilliant hip-hop act The Coup must be one of the magazines most high-profile interviews to date. There’s plenty in here for the €2 asking price, and it’s available now from all Easons nationwide.